Kariye Museum (The Chora Church) and Rahmi M. Koc Museum will appeal to museum buffs. Do some cultural sightseeing at Basilica Cistern and Topkapi Palace. There's still lots to do: take an in-depth tour of Hagia Sophia Museum / Church (Ayasofya), wander the streets of Ortakoy, take a peaceful walk through Selale Parkuru, and admire the masterpieces at Istanbul Modern Museum. For other places to visit, photos, and other tourist information, use the Istanbul itinerary maker website . Cairo, Egypt to Istanbul is an approximately 5.5-hour flight. You can also do a combination of flight and bus; or drive. The time zone difference moving from Eastern European Time to Eastern European Time is 1 hour. Prepare for slightly colder weather when traveling from Cairo in August: high temperatures in Istanbul hover around 34°C and lows are around 25°C. Finish your sightseeing early on the 16th (Thu) so you can travel to Antalya. On the 17th (Fri), examine the collection at Antalya Muzesi, stop by Lidya Suzani Carpet Gallery, and then take in the dramatic scenery at Duden Waterfalls. To see where to stay, photos, more things to do, and other tourist information, go to the Antalya vacation planner . Traveling by combination of train and flight from Istanbul to Antalya takes 3.5 hours. Alternatively, you can do a combination of bus and flight; or drive. Expect a bit warmer weather when traveling from Istanbul in August: highs in Antalya hover around 41°C, while lows dip to 28°C. Cap off your sightseeing on the 17th (Fri) early enough to go by car to Marmaris. 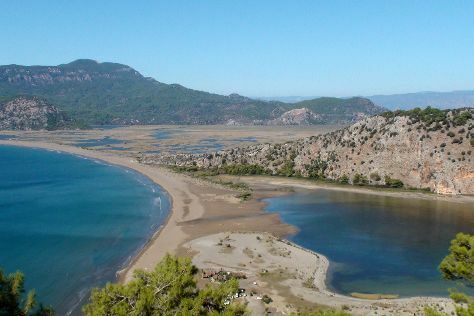 Take a break from the city and head to Iztuzu Beach and Marmaris Zeus Boat. Your itinerary includes some good beach time at Icmeler Beach and Marmaris Beach. There's much more to do: look for gifts at Latina Goldsmith, step into the grandiose world of Marmaris Museum, and take in the waterfront activity at Marmaris Marina. To see reviews, more things to do, ratings, and more tourist information, go to the Marmaris planner . You can drive from Antalya to Marmaris in 5 hours. Other options are to take a bus; or do a combination of flight and bus. Traveling from Antalya in August, things will get little chillier in Marmaris: highs are around 38°C and lows about 24°C. Finish your sightseeing early on the 20th (Mon) so you can travel to Athens. Get some historical perspective at Acropolis of Athens and Temple of Olympian Zeus. You'll explore and learn at National Archaeological Museum and Benaki Museum. There's still lots to do: see the interesting displays at Acropolis Museum, delve into the distant past at Erechtheion, take a stroll through Plaka, and hunt for treasures at Monastiraki. For traveler tips, ratings, where to stay, and more tourist information, you can read our Athens online trip planner . Traveling by combination of ferry and flight from Marmaris to Athens takes 6 hours. Alternatively, you can do a combination of bus and flight; or drive. The time zone changes from Eastern European Time (EET) to Eastern European Time (EET), which is usually a -1 hour difference. Traveling from Marmaris in August, Athens is somewhat warmer at night with lows of 29°C. Finish your sightseeing early on the 25th (Sat) so you can travel back home.